If you missed the IBPSA webinar on 'little know facts' about credit card processing earlier this month, be sure to get a start on learning more about your credit card processing fees and merchant account. Understanding processing fees and rates is yet another aspect your business where the more you know, the better off you'll be in the long-run. While many pet care business owners see credit card processing as a 'necessary evil', accepting credit card payments is an added level of customer service to your customers, and can increase your cash-flow and income overall. To get started, let's distinguish between 'flat rate' card processing fees and 'interchange-plus' fees. Many of us are familiar with payment processing companies like Square and PayPal (not technically a credit card processing company, but they charge a flat % rate). These companies generally charge a flat-fee for all types of card-transactions. This is a newer pricing model as compared to the more traditional merchant account. While easier to understand, the fees are not always the best you can get as a brick-and-mortar business with any kind of significant transaction volume. Square, for example, charges a flat 2.75% for all swiped and 'dipped' (card is present) card transactions. 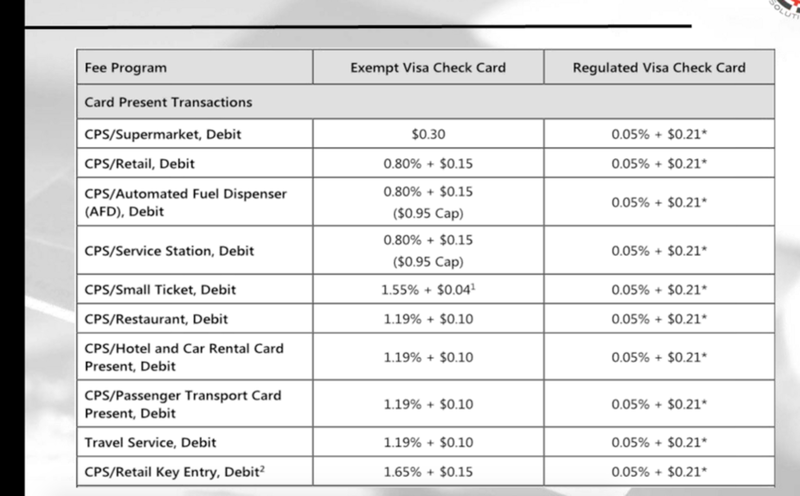 They charge a flat 3.5% plus $.15 for each keyed-in card payments (card not present). This reflects the difference in interchange costs (see below) - reflecting relative risk of fraudulent use of a card - between having a card present (swiped or dipped) versus not-present (keyed-in). These rates do not reflect the difference in processing different types of cards, for example the cost of processing a Visa card as compared to an American Express (AMEX) or Discover, or a corporate card. AMEX, Discover and corporate cards all cost more to process, and what Square is doing is rounding up to cover those fees in ALL cases, even if you are processing a Visa or Mastercard branded card. In other words, they are making more money off of you when they process Visa/MC, and less when the process AMEX/Discover. So when they say 'no surprise fees' and 'no other fees? ', that's true, they are just hidden from you altogether, and they are not really reflecting the true cost (especially when the true costs are lower) of each card transaction. Here's a link to their pricing page: https://squareup.com/pricing. Does that really sound like a good deal? An example of an interchange rate table, 2017. These are the underlying costs that all merchant processors pay to MC, VISA, AMEX and Discover. These rates each vary depending on a variety of factors, including how the transaction is processed. Is the card present and is a signature captured or are you keying in a card number while on the phone with a customer? All merchant processors pay these same rates. So why do processors charge you different rates? Well, each processor needs to make a margin to cover their operating costs and make a reasonable profit (they are business just like you, remember). So, if your merchant processor is paying 1.65% + $.10 per keyed in transaction, they may add 1% plus $.20 per transaction, and you will be paying $2.65% plus $.30 per transaction. Many of the merchant processor's accounts will likely be paying different rates. If you are a big company with lots of volume, you are likely to be able to get comparatively lower rates, as the processor can make a smaller per transaction margin, which is made up by the volume of transactions. Naturally, you want to pay the lowest rates possible. You can do this by shopping around and getting quotes from different processors, and by building your business to a transaction volume high enough to earn lower rates. 1. Long-term contracts. In this competitive market, you should be able to avoid any multi-year contracts with cancellation fees. I would avoid any contract that lasts longer than six months, and any cancellation fees. 2. Long-term equipment leases. Most card processing terminals cost somewhere between $400-600. I've heard of customers stuck in 48-month lease agreements where they are paying $100+ per month! Why pay 10x the value of the equipment? 3. Incomplete and vague 'quotes'. When a vendor says, 'sure, we'll give you a rate of 1.5%', what does that mean? Is that the average rate, or the rate only for the lowest interchange rate, say for a Visa that is swiped and a signature is captured? Any real quote should include ALL the rates and ALL the other fees (statement fees, gateway fees, etc). Get the whole thing, in writing before you sign anything. Remember, when you have your Gingr software, you can integrate your card processing right into the software. We will help you establish a merchant account with our processing partner, who will match the rates you are paying today (and any competitive quote), and provide you with low-cost equipment for a one-time purchase. With no cancellation fees, you have no risk. We will be your advocates to help with any issues.